This is one of those series I read because I love the characters which is just as well because there is an awful lot going on for Ruth, Nelson, Tim, Clough and Cathbad in this, their eighth outing. Fortunately, there is a pretty good mystery too. A young woman from a private hospital, one of those that is for recovery of addiction, is found murdered in Walsingham, she was wearing just her nightgown and her blue dressing gown, in fact Cathbad had seen her earlier that night mistaking her for Mary, the mother of Jesus. The theme of the Madonna runs through this book with Walsingham being a place of pilgrimage and soon after the story starts, the location of a conference for woman clergy, Hilary is attending the conference and being an old university friend of Ruth asks her to meet her in the village, she has something important that she needs Ruth’s advice on. Sadly it isn’t any old bones which are absent from this episode so Ruth’s part in the murder investigation is firmly on the periphery but that doesn’t stop her gathering some useful information! 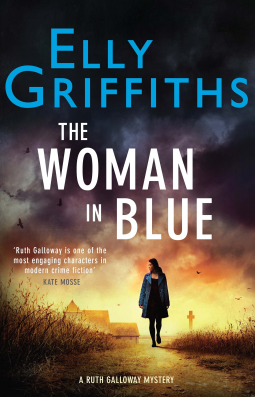 With another murder, the team are kept busy investigating the pasts of the good and the great of the visitors to Walsingham, although with turmoil in their private lives they are forced to prioritise one over the other more than once. As always in this series, there is a past and present connection and with Elly Griffiths choosing religion there was a lot of references to Catholicism and in particular the Virgin Mary and the present day struggle of women working in the clergy against the long held beliefs that this is sacrilege, and I found this far more interesting than I might have thought – the author does have a great way with words, which means that I was able to follow the references without it ever feeling like a Religious Education lesson. With the real action occurring at Easter, Ruth a devout atheist ends up attending some of the events being held in Walsingham complete with souvenir artefacts. There are the obligatory red herrings so although I didn’t get the culprit, I did work out the link between the victims but if I’m honest I wasn’t entirely convinced by the motive but somehow because I feel such affection for the characters that in no way reduced my enjoyment of the novel as a whole. For that reason if you haven’t read the rest of the series, this is not the place to start, this is one series where it is definitely best to begin at the beginning. I’d like to say a huge thank you to the publishers Quercus books for my review copy which I’ve read prior to publication on 4 February 2016. The series is new to me and I like mystery/murder books where the characters continue for ever! Walsingham struck a bell with me. We have a church here dedicated to Our Lady of Walsingham though I never could find for what Walsingham was noted for. I’m a fan of this series and of the Ruth Galloway character, Cleo. So I’m very glad you enjoyed this one. I give Griffiths so much credit for keeping this series going as well as launching her Max Mephisto series. I need to read this but I’m very behind with the series despite having them all, bar one or possibly two – it was actually yourself, and possibly Rebecca, if I remember correctly, that made me think I fancied this series, but I need to make more progress! Unfortunately Cleo it’s a struggle getting the staff these days to allow me to read whenever I’m not working…I think that’s what I’d do if I won the lottery, big-style! I have the first book in the series, and I have been eyeing this one….but I’d better begin at the beginning, right? I love a series in which the characters’ lives are as interesting as the mysteries. It is one of those series where there is quite a lot of the police team’s back stories so better to work through in order. I love this series and am so looking forward to reading this latest adventure…you make it sound so good !